RXR Glen Isle Partners, a defendant in the suits, is building 1,110 condominiums and apartments with commercial and public spaces, along the Glen Cove waterfront. 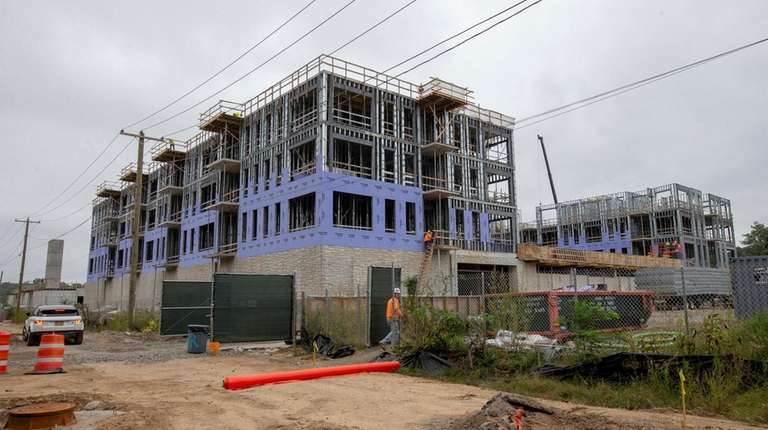 Attorneys for opponents of the giant Garvies Point development on Glen Cove’s waterfront will make their case in an appellate courtroom Wednesday to halt construction, while lawyers for the city and developer will argue that legal objections to the project are meritless. A Supreme Court judge in Nassau County in 2016 dismissed the two suits, one filed by the neighboring village of Sea Cliff and the other by more than 100 residents of Sea Cliff, Glen Cove and nearby communities. RXR Glen Isle Partners, a defendant in the suits, is building 1,110 condominiums and apartments, parks, an esplanade, marinas, restaurants, and retail and office space along the city’s waterfront. The Sea Cliff suit says Glen Cove violated a 2000 memorandum of understanding between the municipalities that called for a significantly smaller project than the one approved. Judge Antonio L. Brandveen said the planning board complied with state law in reviewing the impact of the project on traffic, tidal wetlands, marine life, schools and other matters, and that further environmental studies are not necessary, as the village and residents argue. Marion said Brandveen relied on city documents that include “flat-out lies.”. “We don’t think the court gave any factual basis or reasoning for the decision,” she said. Brandveen said the agreement between Sea Cliff and Glen Cove is not enforceable because the signatories "were not legally authorized to bind the respective municipalities." Bruce Kennedy, Sea Cliff’s administrator, said he is confident the appeals court will deem the contract enforceable. “It would only be unenforceable if it wasn’t a legal contract and it is a legal contract,” he said. RXR plans to complete most of the public space and nearly half the housing units at Garvies Point by late 2019, said Rebecca D'Eloia, an RXR senior vice president. “As we await what we hope will be a speedy resolution of the legal process, we continue to move forward on this critical project,” Scott Rechler, chairman and CEO of Uniondale-based RXR Realty, the majority partner in RXR Glen Isle Partners, said in a statement.